Located by the A-30 motorway (Madrid-Cartagena), Cieza is a full communications network, a crossroad in comunications between the Catilla-La Mancha, Andalucía and Valencia regions. Furthemore, it has railway network through its station, and a coach station as well. The closest airpots, Alicante and San Javier (Murcia), are only 45 minutes drive. A day in July in 1995, at 6.30 a.m. in the 301 National Road called Cieza - Venta del Olivo, one of the most important events in history took place. Was it chance or good luck? We could call it "An Inspired Occurrence" . Mariano Marín Ato and José María Martínez Villa, named Mariano Colines and Mosky by our mates, were going to create an art masterpiece: the Olive Pits Spiting Competition, performed only with the mouth and without straws. -how to manage it? Which are pits in our native land? -We've got peaches, apricots and plums. -No, they are too big. They need to be easy to spit. -The most typical products in Cieza are olives. But a good must make company! -So, let's make it with olive pits then. Thanks very much to those who supported us from the very beginning, specially to those who died. 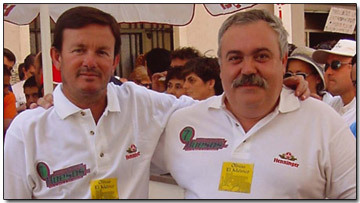 The Asociation "Friends of the Olive Trees "
In 1995, some friends from Cieza and Bartolopoulus descendants created the Amigos de las Oliveras Association (Friens of the Olive Trees Association). They retrieved the competition traditions and habits aiming to make Bartolopoulus dream come true: the Olive Stones Spitting Competition be part of the Olympic Games. After that, the regulation for the competition was written... until today. 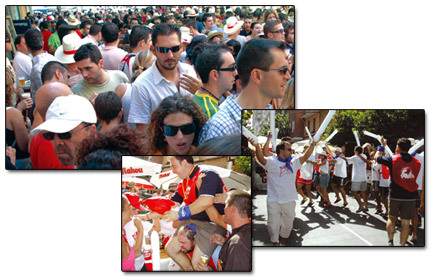 Everybody knows that Sanfermines is much more than a corraling. Likewise, the Olive Pits Spiting Competition has become a very popular fiesta. Last year aourund 20.000 people participated in the event. 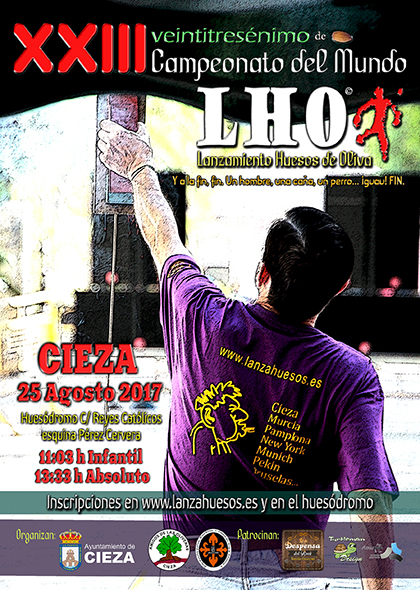 This is just an example of the mood of the people from Cieza: how easy it is to spit an olive pit to have fun. A different life style which attratcs foreign tourist. A GREAT WAY TO HAVE FUN: SPITS-TACULAR!